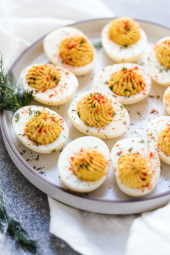 Classic deviled eggs, perfect for Easter, holidays and summer backyard gatherings! This easy and delicious deviled egg recipe is a must! Deviled eggs are such a classic and perfect for the holidays, potlucks, parties and other gatherings. I have tons of appetizer recipes, but Deviled eggs are one of my favorites, so inexpensive and made with ingredients I always have on hand. They are also low-carb which makes them popular with Keto diets. More deviled egg recipes I have are these Instant Pot Deviled Eggs which are slightly different, and these Guacamole Deviled Eggs and Tuna Deviled Eggs for a fun twist. How Do You Boil Eggs So They Peel Easy? I personally think the easiest way to peel eggs is making them in the Instant Pot, they literally pop out of their shells. You can see my recipe for Easy To Peel Hard Boiled Eggs here. If you don’t have an Instant Pot, make sure your eggs aren’t too fresh. Eggs are easier to peel when they are at least 10 days old. For best results, peel your eggs right after they are cool enough to handle. Fully chilled eggs will not peel well. 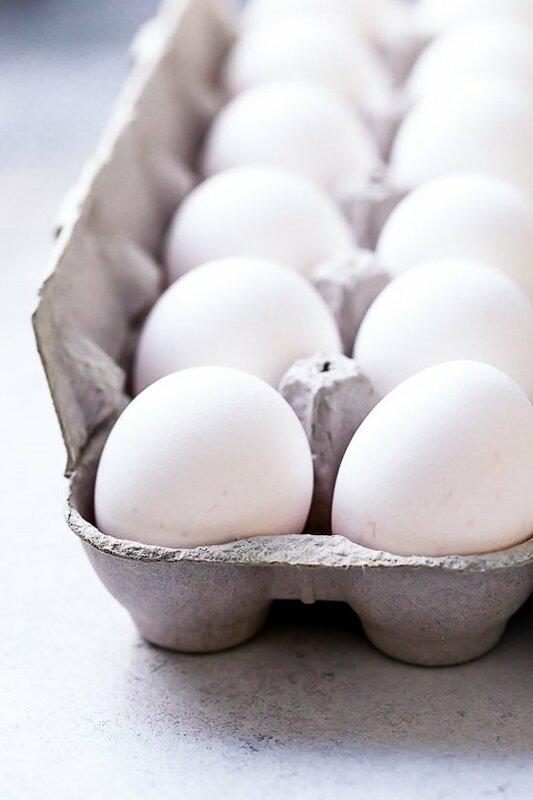 You can peel your eggs ahead of time and store them in the refrigerator. A star-tipped piping tip (affiliate link) will give you the prettiest eggs, but if you don’t have one you can simply use a ziplock bag with the end snipped off. These classic deviled eggs are a great appetizer to any brunch or party and are so simple and easy to make. Use the Stove Top Hard Boiled Egg cooking method or the Instant Pot Hard Boiled Egg method to cook your eggs. Cut eggs in half lengthwise. Remove yolks and put them in a bowl. Add mayonnaise, mustard, salt and pepper to the yolks and mash. Transfer them to a plastic bag, snip the corner and pipe them into the egg whites. Top with chopped chives and paprika.